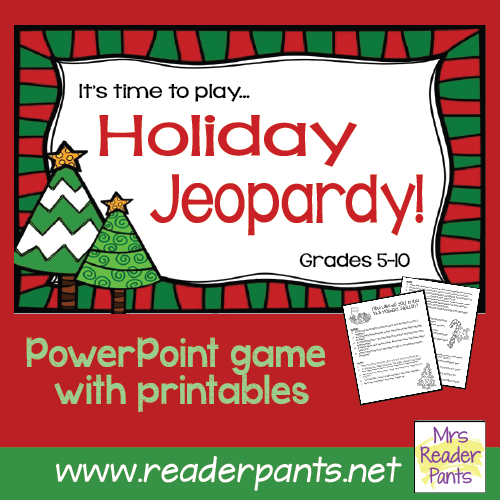 Mrs. ReaderPants: Holiday Jeopardy Game--Great for Holiday Parties! Holiday Jeopardy Game--Great for Holiday Parties! The wood from this Christmas plant makes up Harry Potter’s wand. Name a country that celebrates Christmas in the middle of their summer. How many sides does a dreidel have? Think your students know the answers? Find out with my new Holiday Jeopardy Game! I created this game in PowerPoint, so you won't need to worry about intermittent internet (ahem, my China friends) or school filters (ahem, my US friends) causing problems with access. It's also fully-editable, so you can change any of the questions and/or categories to suit your needs. Note that the Slideshare preview above does not allow users to click the green home button to return to the game board. The TPT download allows users to click the green Home button to return to the board. Likewise, the red "Answer" button connects to the correct answer. It also removes the question from the game board once the question has been clicked. You can reset the game by exiting the slideshow and then restarting it. The game includes 25 questions total, several of which are about multicultural traditions and holiday histories from countries outside the USA. It is "Jeopardy-style," which means that I did not do the answer-in-the-form-of-a-question format. The Jeopardy clues are in either question format or sentences (as with the Harry Potter question above). I included a two-page printable of the questions if you prefer to give the students time to research the questions or work together in groups. 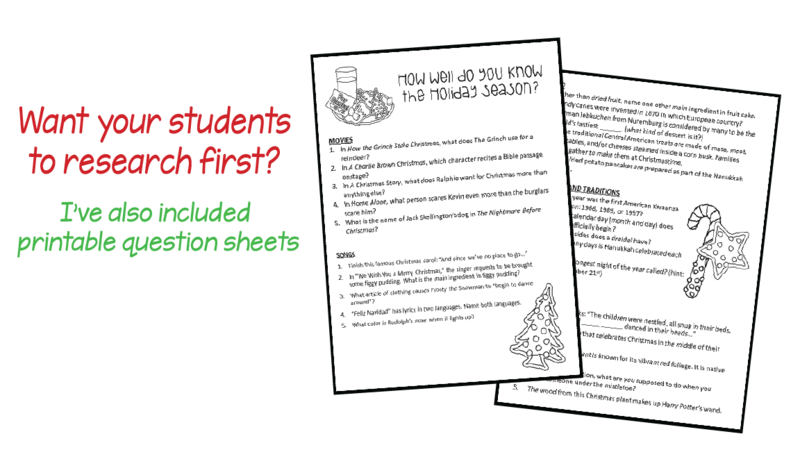 There is also a printable sheet of questions and answers for teachers for those who will use a SmartBoard for the game or ask a student advance the PowerPoint slides. This will also help you see the answers before the students do, so you can ask them to elaborate or give them hints if you want to help them out. 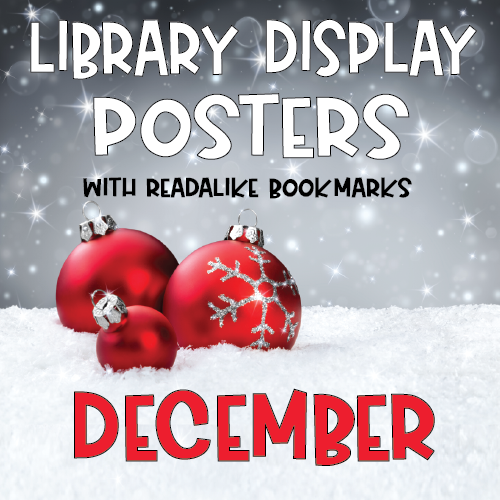 The questions aren't difficult or tricky, but they will require some prior knowledge of popular holiday movies, Christmas carols, and December holiday traditions around the world. For that reason, I recommend this game for Grades 5-10. The movies featured are on TV all the time at this time of year. They include classics such as Home Alone, A Charlie Brown Christmas, The Grinch, The Nightmare Before Christmas, and A Christmas Story. The carols are popular songs most children have heard in elementary school, including "Frosty the Snowman," "Rudolph the Red-Nosed Reindeer," "We Wish You a Merry Christmas," "Feliz Navidad," and "Let It Snow." I love making trivia games and plan to do more of these! Students always enjoy them, and they are a fun way to review and learn new things. I purchased the game from TPT. Love this for my middle schoolers! One problem, no matter what category I click on, when I click the green Home button and return to the categories, "Movies for 800" and "Songs for 800" disappear. Any suggestions for how to fix this? Thanks! Thank you so much for letting me know. I just made a small tweak in the PowerPoint and re-uploaded the file to TPT. Please try downloading again and let me know if it made a difference. 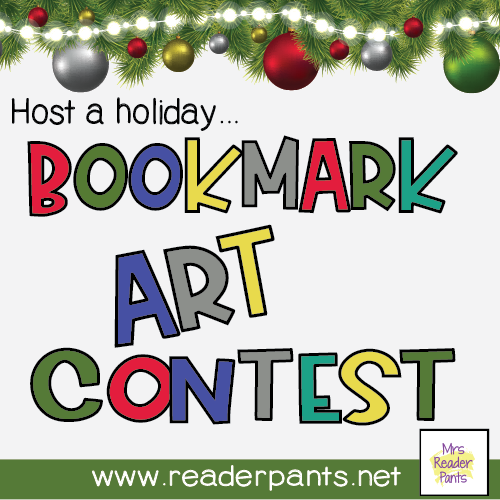 You can comment here or email me at leigh@readerpants.net. Thanks again!